I haven't had any knitting or sewing projects the last week or so, but found the idle time to be a nice break. 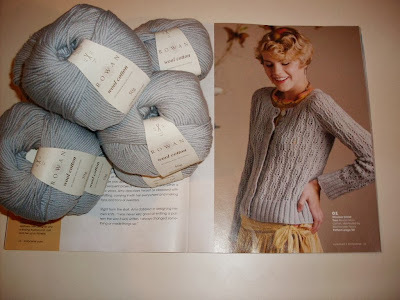 Here's what I will be working on this weekend: the Windsor Cardi from the summer 2011 issue of Knitscene. It was designed by Amy Christoffers. I am using the recommended yarn, Rowan Wool Cotton, since I was able to find it on sale. This will be a fun lace project!